The Millay House in Rockland. A Pulitzer Prize-winning poet experienced her first moments of life in a modest duplex in the midcoast city of Rockland. 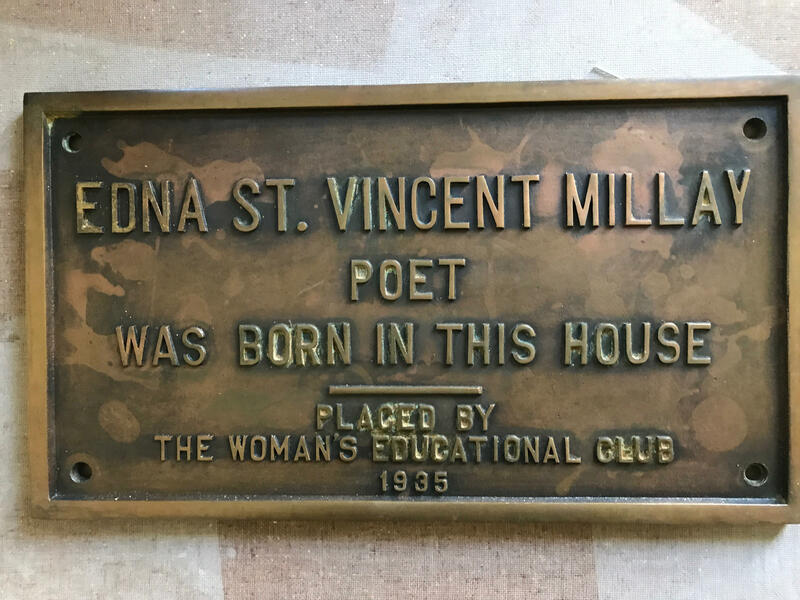 A plaque once boasted that “Edna St. Vincent Millay, poet, was born in this house,” but it has since been removed, and over the years the house itself has fallen into disrepair under private ownership. A local nonprofit now wants to bring the Millay House back to life and use it as an anchor for a new annual festival of poetry, literature and the arts, in a town otherwise known for lobsters and limestone. As a real estate agent, Michelle Gifford has seen a lot of houses in the midcoast. But the duplex at 198 Broadway has a feature like no other listing in the world. She says there’s some debate about which part of the house Millay’s mother, Cora, gave birth on that cold winter night in 1892, but there’s no question that this was the building. The plaque that marked the Millay House in Rockland. Gifford leads the way up a narrow staircase, and we step through the studs of a wall that once separated the two apartments, and into a small bedroom in the front of the house that overlooks the street. “We believe this to be her birth room, looking east on the north side of the building. Maybe the bed was here. According to the biography, Cora was seen to by a midwife and her younger sister, who was 11 years old, who ran through the snow to get the midwife in the middle of the night. So it’s a great story. We believe this to be the room, but there’s no way to be sure,” she says. 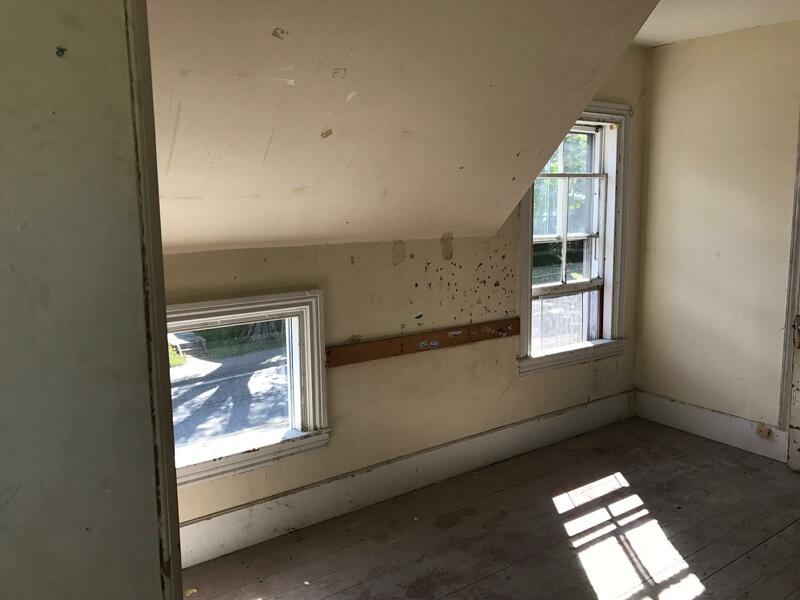 The room still looks lived in, but much of the house has been stripped down to the studs, and the original plaster walls removed. Westkaemper says the project is part renovation, part restoration. “So we’re trying to get as authentic as we can — not to museum-level restoration, but to a level where we have nodded to the period,” she says. The group’s purchase of the house was made possible, in part, by a donation from Burt’s Bees founder Roxanne Quimby, and the group continues to raise funds to carry out its mission. The room where Edna St. Vincent Millay was thought to be born. Westkaemper says the previous owners had removed the plaque, mounted with great ceremony in 1935. But she says it’s understandable that living privately in an historic birthplace can be a challenge when fans come knocking. “The burden is — especially if there’s a plaque on the front — people are constantly coming by, taking pictures, knocking on the door, asking to see the room. And it’s your private home — you’re not willing to let the public wander through at will,” she says. The plaque, which had been donated to the Rockland Historical Society, will be remounted on the house on Wednesday. And Millay House Rockland members plan to use the site as an anchor for an annual festival that makes its debut this week. Local art gallery owner Tom O’Donovan says it will offer 35 events in venues that are within walking distance to a downtown that has undergone a renaissance over the past two decades. “When you drive down Main Street you see signs that say ‘Welcome to Rockland, the art capitol of Maine,’ 20 years ago that would have been far away. And now we are in a place to imagine a celebration of poetry, literacy, and all of the wonderful things that Edna stood for, coming out of this rural community, trailing her poetic energy behind her,” he says. Highlights of the festival include several Millay biographers, U.S. Poet Laureate Tracy K. Smith and the world premiere of the stage play “Vincent.” Gifford says it’s only right that Millay, and her connection to Maine, be given a spotlight. “I think we are trying to save history. Edna St. Vincent Millay was a famous poet, an iconic figure for women’s liberation, for the world of poetry, literature, theater — and it’s only right that we share it with future generations,” she says. The Millay Arts and Poetry Festival runs Thursday, Friday and Saturday in Rockland.